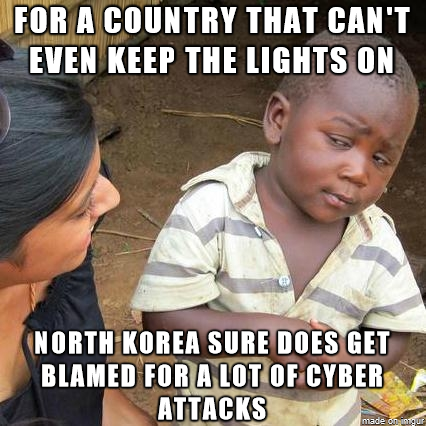 No, seriously, how many attacks have now been attributed to the Great Dark Spot? Are the government's attribution dice loaded? Did their spinner get stuck? Does anyone remember the last time it wasn't North Korea*? It makes you wonder two things: 1) Why have we not yet figured out how to stop them?, and 2) Why have more capable and resourceful countries not figured out how to emulate them and become even more successful at it?